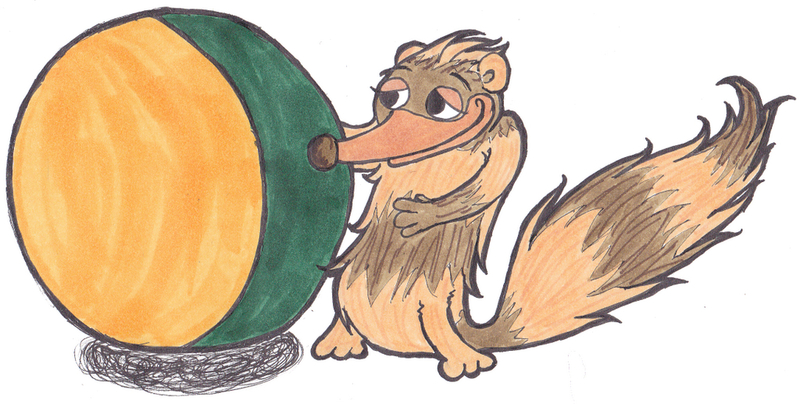 In the idea for this week, you control a little Weazel attached to a ball and try to pick up as many power ups as you can, while avoiding other Weazels and negative objects. The game is an attempt at creating a complex game from a simple mechanic. Many games these days ask the player to learn a set of complex controls. This idea was inspired by last week's idea, Gnomes and Fairies, a toddler's game with only one possible action available, movement. My personal challenge this week was to create a game with the same mechanic (only movement allowed), but to create a game that adults would not get bored of. You play as a "Weazel Ball", a motorized toy that rolls around erratically in the real-world. In the game, you control where the weasel and ball move around the screen within the walled boundaries of the level. There are many objects you can pick up on the screen, some of which will give you more points or help you, some of which will not. The on-screen items only appear for a short period of time, so the player must decide which route to take around the screen to pick up as many of the good items as possible. Other characters are also rolling around the level, if you bump into them you are both stunned for a short period of time. The other characters can be more Weazel Balls or other toys, such as wind-up toys and so on. The game can be played in single player mode, or multi-player mode. In multi-player mode, players are competing for the resources on the screen. Players get times bonuses for picking up many points bubbles quickly in succession. Each level lasts for a fixed time. If in single-player mode, the player will progress to the next level if they obtained a minimum number of points for that level. In multi-player battles, you can choose from a single level battle or have a tournament where specific levels are chosen at the beginning and the player who wins the most levels is the ultimate victor. Each level has a different border shape that the player(s) can roll around in. Initial levels will have simple shapes, such as squares, circles and crosses. More difficult levels will feature more corners and tight sections to navigate. For example, there will be thin corridors that the player needs to roll down to reach high value items, that might disappear before the player reaches them. Weazel Ball Derby is suitable for many different platforms. On touch screen or stylus devices (e.g. iPhone, Nintendo DS), the player navigates the Weazel with their finger. Wherever they are touching now (or last touched) is where the Wezael is. On a PC/Mac, the player moves the Weazel around the screen by moving their mouse. Wherever their mouse is currently is the position of the Weazel. On XBox 360 or PS3, the position of the Weazel is controlled by one of the sticks on the controller. On Nintendo Wii, the Weazel is controlled by pointing the remote at the screen and then moving left or right and so on to move the Weazel around. If the player has a Balance board, the player can stand on the board and use their weight to change the direction that the Weazel is traveling in currently. Note that changing direction on the balance is a slower and less precise mechanism than other control methods. Due to this, the balance board can only be used in single player mode and will make the entire game slower so that players have time to reach on-screen items. The game features a simple mechanic that most people will be able to understand intuitively. This means that people will be able to pick it up and play straight away and start succeeding straight away. The on-screen items and the increasing difficulty of reaching the items will make the game dynamic and interesting and therefore will encourage players to keep trying to get a better score.